Regardless of how you feel about the particular narratives in his histories of American poetry—and for P&PC they can be a bit of a mixed bag, as we'll explain in a moment—you've gotta love John Timberman Newcomb's research strategy. Maybe that's not the most flattering way to open a review, but it's totally true. His sequenced books—Would Poetry Disappear? 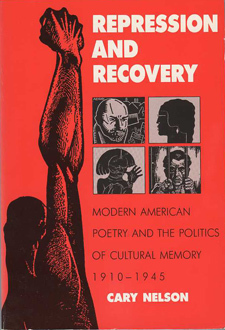 American Verse and the Crisis of Modernity (2006) and How Did Poetry Survive? The Making of Modern American Verse (2012)—look past the oversimplified narratives and supposedly "key" texts and movements constructed to explain and package American poetry and find in the process huge archives of interesting material that everyone seems to have forgotten and that, when brought to light, complicate the stories and party lines by which poets and literary historians have been navigating for, like, ever. That is, while most scholars are looking one way—picking, for example, over the corpses (er, we mean corpora) of a few great modern poets to find some overlooked detail to bring to light—Newcomb looks the other way, at the masses of stuff that aren't really hidden but that everyone's chosen to ignore because they think they know what it's all about. Newcomb is certainly not the first or only scholar of poetry to work this way. Cary Nelson did it spectacularly back in 1989 with the publication of Repression and Recovery: Modern American Poetry and the Politics of Cultural Memory 1910-1945, for example, and many scholars of poetry by women, working class writers, and writers of color have made it part and parcel of what they do. But Newcomb's success doing so now, over the course of two books and after the era of large-scale canon expansion, shows us that what Nelson claimed and illustrated over twenty years ago—that "we no longer know the history of the poetry of the first half of this century; most of us, moreover, do not know that the knowledge is gone"—is somehow, amazingly, still the case. With PhD programs in English turning out high numbers of graduate students focusing on modernism and American literature, all of whom would probably cut out the Norton Anthology's table of contents in exchange for new material and new archives to distinguish their work from their peers, Newcomb's research method—when everyone's looking one way, just look another—stands as a sort of testament to the persistent myopia of American poetry studies. One might say that while most everyone else is watching the same ol' rabbit being pulled out of the same ol' hat, Newcomb's trying to figure out how to saw the magician in half. So, a few examples. 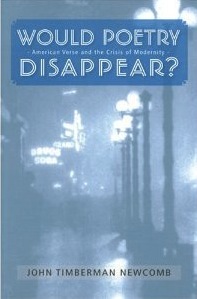 In Would Poetry Disappear?, Newcomb went back to the period between 1880 and 1910—a supposed "dearth" period in American poetry when (so the traditional line has gone) no one was writing poetry and, even if they were, it wasn't any good and isn't worth studying—and he discovered that, lo and behold, more people were writing than we thought and, lo and behold again, it could be pretty interesting if you looked at it the right way. Between 1880 and 1910, Newcomb argues, a new generation of would-be poets faced an almost paralyzing predicament. 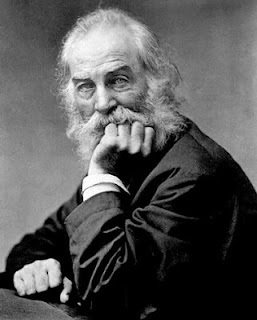 The Fireside Poets—the revered and astonishingly popular group of sagely, bearded, three-named New England writers including Henry Wadsworth Longfellow, William Cullen Bryant, John Greenleaf Whittier, James Russell Lowell, Oliver Wendell Holmes, and Ralph Waldo Emerson, whom many people perceived to be the first "real" American poets—were old or had died. Younger poets wanted to move American poetry forward and address the concerns of a new "modern" era in new ways and forms (the Fireside Poets, btw, were famous for their religiosity, dedication to an idealistic but quickly fading agrarian way of life, and scorn for anything modern that would challenge that religiosity and agrarian ideal), but whenever they tried to do so, they were criticized for not writing like the Big 6, who had made American poetry American after all. At the same time, though, whenever poets in the new generation did write like the Big 6, they were criticized for being derivative, for being Fireside knockoffs or retreads. This double bind—in which poets were damned if they wrote like the Fireside poets and yet damned if they didn't—left American poetry in such a pickle, Newcomb claims, that some people wondered if poetry had in fact run its course and was on the verge of disappearing. Despite our sense today of that time as a dearth period out of which the Phoenix of "modernism" would spring on or about 1910 or 1912, however, Would Poetry Disappear? reveals that people were in fact writing or trying to write "literary" poetry, and if we read that poetry from the perspective of its relationship to this double bind, it can get kind of interesting. In the process, the poetic renaissance of "modernism" looks less unique and messianic; it didn't breed lilacs from the dead land and feed dull roots with rain, because the land wasn't in fact so dead and the roots weren't that dull. As our mama used to say, there are no dull texts, only dull readers. How Did Poetry Survive? is a sequel to Would Poetry Disappear?—a story of how the New Verse movement in American poetry confronted the predicament of 1880-1910, built on the energies of poets from that time, and made poetry relevant to modern life both by taking on new subject matter in new ways and by forming a new literary economy of poetry-specific publications, prizes, and organizations akin to those already existing for the other arts. (The Poetry Society of America was founded in 1910; Poetry magazine in 1912; the first Pulitzer for poetry was awarded in 1922; and, greatly influenced by the success and cultural resonance of the new poetries, the Iowa Writers' Workshop was founded in 1936.) In a sense, then, How Did Poetry Survive? is a history of what Charles Bernstein has called our age's "official verse culture," and it's a departure from many books on modern poetry because it doesn't focus on a few key revolutionary figures (a Big 6-equivalent of T.S. 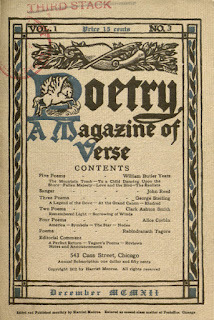 Eliot, Ezra Pound, William Carlos Williams, Wallace Stevens, Robert Frost, and Gertrude Stein, for example) or fetishize avant-garde cliques like Objectivism or Futurism; instead, it attributes poetry's "survival" to a large scale shift that was effected not by messianic figures or movements but by "the collective efforts of hundreds of people involved in the New Verse movement"—efforts that were both more populist and more diverse than the stories we now tell about "modernism" would have it. Unlike the Fireside Poets who—for Newcomb at least—disengaged from modernity and retreated into nostalgic fantasies of, and elegies for, a disappearing America, the New Verse movement deliberately and systematically engaged that modernity and especially the modernity of urban life. (Other scholars don't necessarily agree with Newcomb's take on the Fireside Poets, by the way; in Poetry after Cultural Studies, see, for example, Angela Sorby's study of Longfellow's "The Birds of Killingworth," which confronts the mass killing of birds and thus becomes part of the early U.S. environmental movement.) If Longfellow was about God, farms, and family homesteads, the new poetries were about the gutter and skyline, the skyscraper, and the subway; How Did Poetry Survive? ends, in fact, with three chapters about poems that analyze the social and cultural impact of these very subjects. Poets in the New Verse movement published widely in newspapers and magazines and, in taking urban-capitalist modernity as a key topic, experimented with form, diction, syntax, and various modes of representation in all sorts of ways "to create a poetry of everyday experience that was widely accessible to nonspecialists, yet still sufficiently complex and nuanced to attract the admiration of literary professionals and connoisseurs." Some of these poets you may remember but won't find all that many people talking about at the Modernist Studies Association these days: Carl Sandburg, Edgar Lee Masters, Vachel Lindsay, Edna St. Vincent Millay, Sara Teasdale, and Harriet Monroe, for instance. Others—like Arthur Davison Ficke, Max Eastman, Floyd Dell, Orrick Johns, Alice Corbin Henderson, Jean Starr Untermeyer, Witter Bynner, James Oppenheim, Maxwell Bodenheim, Elinor Wylie, Laura Benet, George Sterling, Clinton Scollard, Margaret Widdemer, and Marguerite Wilkinson—you may have never heard of unless you're in the habit of casually browsing through the early years of magazines like Poetry. 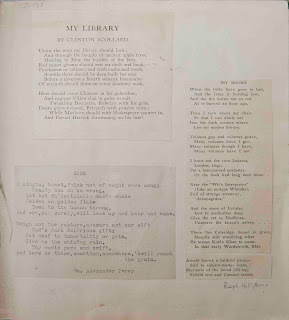 We here at P&PC can vouch for their popularity, too; we learned of them not from Poetry or Newcomb's book, but by examining poetry scrapbooks kept by ordinary readers during that time (like the one pictured above, for example), which are chock full of verse by these and other folks attached to the New Verse. Newcomb takes on the difficult task of re-introducing these poets in two ways. Because this is a book about collective accomplishment and not individual talent, he does not dedicate chapters to individual writers and thus reproduce the logic that narrowed modern poetry down to the Big 6 over the course of the twentieth century. 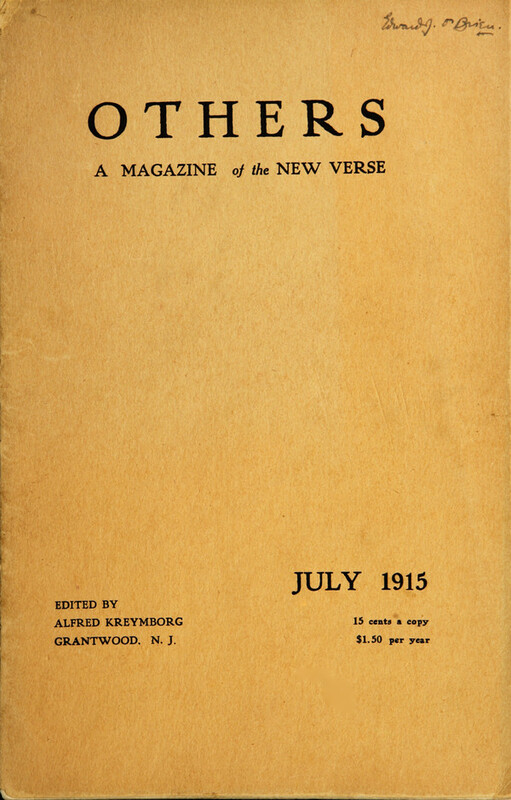 Instead, the first part of the book ("Inventing the New Verse") focuses on how this poetry and its institutions emerged and functioned as we wouldn't expect them to have functioned in four publications or "little magazines" of the time—Poetry, The Masses, Others, and the Seven Arts—and the second part ("Keys to the City") centers, as we've said, on three subject areas of regular concern for the new poetries: the modern cityscape, the skyscraper, and rapid transit. "Keys to the City" is more or less a straightforward (and oftentimes compelling) analysis of how poets, to varying degrees of success and sophistication, took on subjects and themes that were new to literary America's poetry. 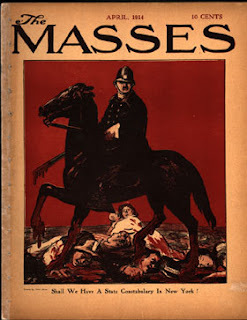 The first part, however—and especially Newcomb's discussions of The Masses and Others—is a little more complicated. Rather than submit to conventional wisdom that The Masses was a place for "sermonizing" poetry of social engagement and radical politics while Others was a place for iconoclastic aesthetic experimentation by and large detached from social concerns, Newcomb reveals that The Masses was far more invested in aesthetic experimentation than scholars tend to assume and that Others was far more concerned with the subject matter and politics of modernity than we think. "To identify The Masses wholly with radical politics and traditional forms misses its substantial institutional and aesthetic impact upon the New Poetry," he writes, "just as limiting Others to a retrospectively constructed canon of experimental poetry overlooks the socially progressive force of its avant-gardism ... Resituating The Masses and Others as complementary rather than opposing helps us to see the New Verse as a dynamic discursive field committed to a synthesis of 'political and aesthetic points of view.'" In pitching The Masses and Others as hybridized and "complementary" sites of poetic work, Newcomb effectively breaks down an exaggerated but nevertheless real divide between two "camps" in the study of modernist poetry: those people interested in the poetry of organized social movements and political subject matter (aka the school of Cary Nelson), and those interested in poetry of aesthetic and formal experimentation (aka the school of Marjorie Perloff). You might remember the recent brouhaha when Helen Vendler harshed on the Penguin Anthology of Twentieth-Century American Poetry edited by Rita Dove? (For Vendler's harsh, click here; for Dove's response, click here.) Kinda the same sort of thing. For Newcomb, it's not the formal experimentation of modern poetry that allowed poetry to survive the crisis of 1880-1910. Nor is it modern poetry's turn to social themes and subject matter that allowed it to survive. Rather, it's the combination of these two traits that makes it modern and—more importantly—made it relevant for American readers. How Did Poetry Survive? does not come out and say it explicitly, but it seems to be claiming that, all this time, as one camp of poetry criticism has been berating the other in one form or another, poetry scholars and critics have actually been two sides of the same coin. They were right. And we were right. And approaching modernism via Newcomb's map of the collective accomplishment of the New Verse—rather than via a Big 6 or something like it—can show that to us. Everyone goes home happy, right? Well, not completely. For all of its dedication to expanding and retelling the narrative of modern poetry, How Did Poetry Survive? perpetuates several old-school plot lines that really need to be rewritten as well. For starters, Newcomb's focus on Chicago and New York further solidifies those cities as the twin centers of American modernism without recognizing that the New Verse in fact had a much broader geography. 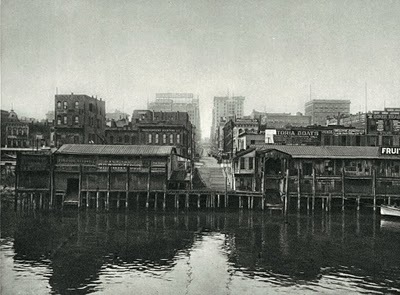 In Portland, Oregon, for example, several local poets seeking to engage both American and Pacific Northwest modernity (Charles Oluf Olsen, Leland Davis, Eleanor Hammond, Ethel Romig Fuller, Howard McKinley Corning, Borghild Lundberg Lee, and Ada Hastings Hedges, all of whom published in Poetry) were staging a version of the more well-known New Verse scenes back East; the Portland Telegram called them an "insurgent group" because of their desire to wrest control of, and thereby make more relevant, the Northwest Poetry Society, and Poetry's editor Harriet Monroe visited them in 1926, suggesting that she and other New Verse poets recognized that while there were definite scenes in the nation's two largest cities, the renaissance they were leading and learning from was in fact a much broader phenomenon than even the "hundreds of people" Newcomb pegs to Chicago and New York. In fact, it's quite possible that without these and other poets around the nation sending their New Verse poetry to Poetry (like so many trains sending livestock to the Windy City's slaughterhouses, perhaps), Chicago might never have achieved the status as a literary center that it ultimately acquired. Scholars have been tracking this geographic problematic in regard to other modernist centers—that the "Harlem" Renaissance wasn't happening only in Harlem but in African American communities across the U.S., for example, or that modern artists were involved in scenes throughout Europe and not just Paris—and thus, rather than adhering to a narrative in which Paris, London, New York, and Chicago lead the way, are mapping out what "modernism" meant in various places and how it took shape in relation to different social and cultural forces. We here at P&PC don't see any reason why the same shouldn't be done in studies of American poetry as well, giving artists across the nation a share of the credit for "modernizing" poetry that places like the Big Apple and the Hog Butcher For the World have otherwise been monopolizing for so long. Then there's the issue of Newcomb's focus on "urban" America. 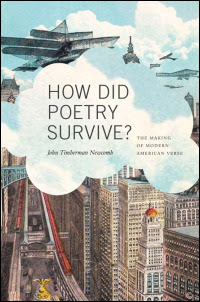 Certainly, the New Poetries took on new subjects and themes like the skyscrapers and subways that occupy Newcomb's attention in the second half of How Did Poetry Survive?. And certainly they engaged urban modernity in ways that the Fireside Poets did not. But Newcomb's guiding rubric positing that the new verse was urban in character (his Introduction is titled "Modernism of the City") follows a now-outdated critical tradition of casting the literature of urban spaces as more legitimate, more universal, and thus more worthy of critical attention than "regional" literature taking place "out there" in small towns or rural communities stuck in the past and on the periphery of where the supposedly "real" action is; critics like Judith Fetterley and Marjorie Pryse have broken down this binary that, in conventional narratives of American literature, makes the urban center into a default position (urban, engaged, important, universal, and "realist") against which everywhere else is imagined to be backward, disengaged, simple, of local interest and "local color" and thus merely "regional." We here at P&PC suspect that there is much to be learned from the New Verse about how modernity was affecting more than just urban centers, and we'd thus call on critics to stop fetishizing the city as somehow the epitome or primary barometer of modern experience. 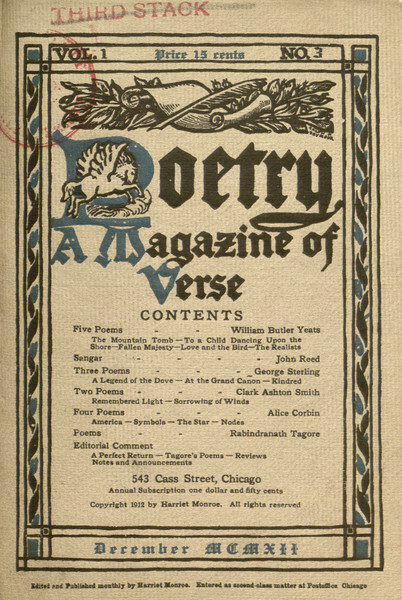 For example, Vachel Lindsay—a famous figure in the New Verse movement—lived in Springfield, Illinois, traveled the U.S. (oftentimes on foot) reading to people in between the cities, and helped pave the poetry-reading circuit at schools in the South and West where East Coast poets wouldn't have deigned to visit since they couldn't imagine any "culture" out there in the hinterlands. In fact, Lindsay called on poets to leave their urban centers and bring their art back to small towns. It is time, we think, to revisit the urban bias of modernist studies and realize that "modernity" didn't just happen in cities and to poets living in cities, but happened elsewhere in various ways as well; after all, if we focus only on the cities with their skyscrapers, gutters, and rapid transit systems, we not only ignore how things like electricity, telephones, automobiles, changes in food production and distribution, the building of Carnegie Libraries, etc. 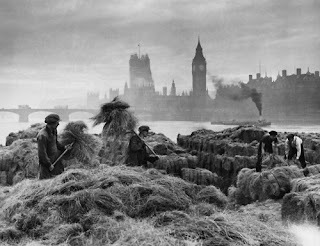 transformed and modernized life outside of urban centers, but we also risk losing sight of the larger systems of production that provided the meat, grain, cotton, timber, and other things that the city needed and consumed. In a sense, modernism has been so busy studying the poetry of "blue" areas that, like the Democratic party, it has caricatured and thus lost the "red." How the New Verse related to, understood, and analyzed modernity as something more than an urban phenomenon is a crucial but unacknowledged part of Modernist Studies and one that, from our perspective, How Did Poetry Survive? does nothing to correct. Newcomb makes it clear in both Would Poetry Disappear? and How Did Poetry Survive? that he's writing about "literary" poetry and not (for example) the scads of advertising poetry written during this time (its own sort of "modern" verse that many New Verse poets tried their hands at as well) or the many popular poems being printed in daily newspapers, children's magazines, calendars, almanacs, greeting cards, fliers, broadsides, and other places that have provided fodder for many a P&PC posting. Nevertheless, we think that sticking to a narrative of American poetry that proceeds, evolution-like, along a path from the Fireside Poets to the Moderns and the present day's iterations of the official verse culture inaugurated by the New Poetries is a problem. By continuing to make "literary" poetry the default narrative and ignoring the reams of poetry being circulated elsewhere (both then and now), How Did Poetry Survive? presumes that the "survival" of poetry in this form—and "literary" poetry's various anxieties about the state of its well-being—is the thing that matters and that the ways that other, even more widely circulated poetries were modernizing, engaging the forces of modernity, and affecting people's lives in the new consumer capitalist economy is of little or no consequence, either to literary scholars or to the New Verse. The book's answer to its title question thus scans something like: what saved poetry from the brink is the official verse culture that we have inherited and the writing we think of as "poetry" that yields to established critical methods meant to get at certain things more than others. In a sense, it's a history written with an end in mind and thus made to seem like where we've gotten has been inevitable: whether or not we remember the large number of players involved, what saved poetry was a group of self-consciously literary poets concerned with precisely the the dominant things we value and study now: formal experimentation and progressive politics. Such a narrative legitimizes the present state of poetry studies and its continued refusal to broaden its viewfinders to consider other narrative arcs that American poetry has taken (and survived by), other poets who contributed to the modern experience, other values their poetry embodied, and other uses that poetry served (and continues to serve) in American life. So, what happens to the neat, linear, single-strand narrative of American poetry put forward in these books when we take a step back and view it in a larger picture—against the larger landscape of popular poetry, for example? 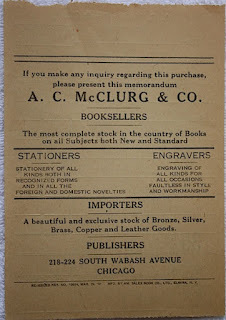 Well, we can tell you that the first edition of Granger's Index to Poetry was published by Chicago's A.C. McClurg publishing company in 1904, eight years before the founding of Poetry magazine and just a couple of blocks away from where the Poetry Foundation is located today. 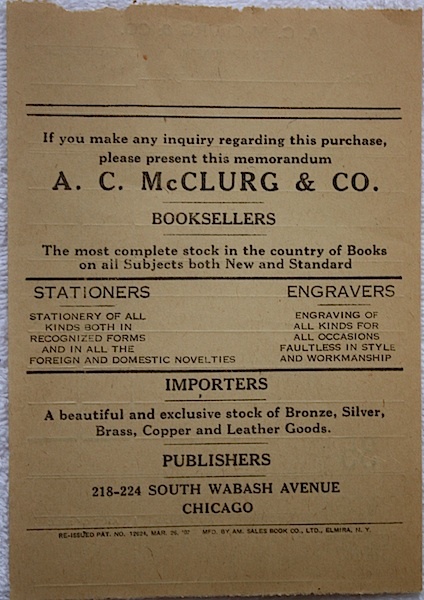 Apparently, so many patrons had been coming into McClurg's retail bookstore (located at 218 South Wabash Street) looking for individual poems that McClurg's decided to do something to help customers out. Thanks to Edith Granger who did much of the work, Granger's listed 30,000 poems indexed or cataloged by title, author, first line, and subject—this in an era when poetry, according to How Did Poetry Survive?, was hanging by the thinnest of threads. (For more on Granger, see the great "Edith Granger Project" being run by Audra Deemer.) 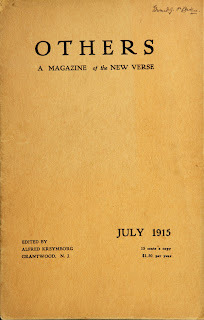 The next edition of Granger's (1918) would include 50,000 titles, and most of those were mainly poems printed in books and anthologies, not in magazines, newspapers, or elsewhere. What the juxtaposition of Granger's and Poetry—two publications, both assembled by women, and both published out of the Windy City—reveals is that the exaggerated drama of poetry's extinction and resurrection at the core of How Did Poetry Survive? is dramatic only because it features a certain type of poetry important to certain people. For many other people, poetry wasn't dead or dying or irrelevant; it was in fact proliferating so quickly that folks needed an index devoted to it just to keep track of it all. And if Poetry could be said to have reinvented or transformed how people went about getting their poetry, Granger's could be said to have done so as well: it became the go-to public library reference guide for poetry all across the U.S. for most of the century—and it's still going too. In other words, maybe it wasn't just Poetry and the little magazine scene that Poetry represents to us today, but Granger's, which we've more or less forgotten but which tells another kind of story, that helped American verse survive in a modernizing world. If you don't want to calibrate How Did Poetry Survive? in relation to Granger's, then let's do so via an individual poet like Edgar Guest (pictured here)—the "people's poet" of the Detroit Free Press who published a poem in that paper every day for thirty years. 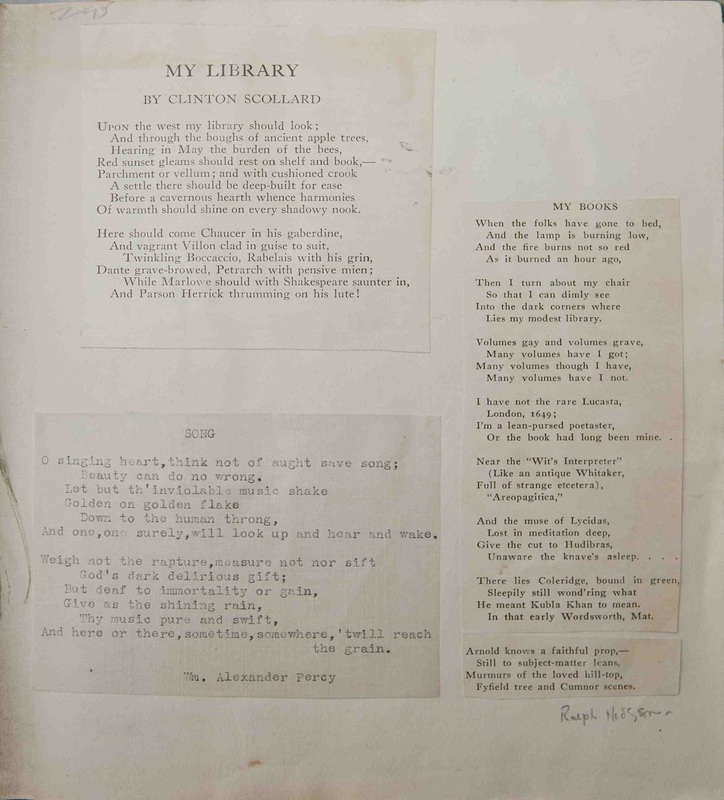 Perhaps the most widely published poet of the twentieth century, Guest published thirteen volumes of verse between 1909 (three years before Newcomb's study begins) and 1925 (the year Newcomb's study ends). Existing almost completely apart from the New Verse movement, Guest was a sought-after speaker, a syndicated poet, a radio host, and an often scrapbooked writer (scrapbooked far more often than the New Verse poets, btw, and in scrapbooks kept by both white and black readers). And he's just an example of similar writers who were managing to make their poetry relevant to people's experiences; folks like Anne Campbell, Helen Welshimer, Walt Mason, James Metcalfe and others kept their poetry going despite the supposed pressures that other poets felt; Campbell, for one, made up to $10,000 dollars a year doing so. Remembering these types of figures (who have been so unstudied that we'd be totally irresponsible for presuming that they weren't modern) makes one wonder about the disproportionate credit given to the New Verse in Newcomb's book. If we want to study poets who spoke to the modern experience of everyday life, then why not study Guest & Co. as well, who so clearly did, and who did so without facing an identity crisis? A swift Death-drop below you. In fact, as "Song of the City" proceeds—in a fairly innovative verse form of varying line lengths, metrical structures, and strong enjambments, mind you—to go through a catalog of urban sounds particular to the modern city (page two of the broadside, pictured below), Edholm even picks up on the topic of Newcomb's Chapter 8 ("Subway Fare: Toward a Poetics of Rapid Transit) with the line, "The screech of the hurtling trains, that hurry recruits to the battle." Skyscrapers and rapid transit in the same 1908 poem, yo! Judging from Edholm's publishing history—which has far more to do with pulp magazines than with the little magazines featured in How Did Poetry Survive?—we don't think he had a whole lot of truck with the New Verse movement. One capsule biography says he was born in Omaha in 1879, was raised by parents who were also writers, studied painting in Europe, had his work exhibited at the Whitney, and eventually settled in Dobbs Ferry, New York, a town of 4,000-5,000 on the Hudson River. 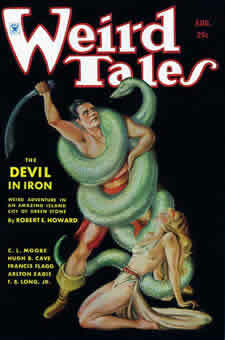 He was an editor at Live Stories and Out West and published widely—poems, articles, short stories, serials, novels—all over the literary map, from the New York Times and The Saturday Evening Post to Sweetheart Stories, Weird Tales, Astounding Stories, and The Phantom Detective. Are you saying to yourself about now, "Oh, that Charlton Edholm"? Neither are we. What we find compelling about "Song of the City" is that its writer was steeped in the popular press and not in the literary culture of the New Verse, and yet, before the New Verse Movement came along, Edholm had already gone partly where they were going to go—in fact, had called on poets to go there. What would it mean to a history of modern American poetry if the New Verse were in fact called into being from the pages of something like Weird Tales or Astounding Stories instead of Poetry and Others? (Yes, we know that Weird Tales and Astounding Stories were started in the 1920s and 1930s, but our point still stands.) Given Edholm's poem, it's not impossible to frame a story of modern poetry in this way. But for all of its claim to break free from the binds of conventional literary historical narratives—the Big 6, the divide between political and experimental camps, the focus on small avant-garde movements, and so on—How Did Poetry Survive? ultimately ends up reenforcing more of those narratives' limitations than one might expect. Here at P&PC, we certainly like the impulse behind How Did Poetry Survive? as well as its restoration to attention some of the forgotten figures who devoted themselves to the vitality of American poetry. At the same time, though, we want to stand the Modernist Poetry Critic, like Edholm stands his Poet, on the topmost girder of the modern city and point out the rest of the poetry that's missing from Modernist Studies but might nevertheless be sung about—or at least studied. Hey Amanda! Thanks for the note. Yes, I've done a ton of research with poetry scrapbooks, which form the archival basis of Chapter One in /Everyday Reading/ (due out in October, btw, but available for pre-order now). I've collected over 150 of them during the past 6-8 years and am hoping to find a way to get them digitized and made readable/searchable online so other people can see how cool they are. Any ideas....?